Philly’s dining scene trends toward casual, no-reservations-needed spots with tasty, unpretentious food and, frequently, BYOB policies. But sometimes you want to get all dressed up and have a dining experience. Maybe you want to pop the question. Or it’s your first Valentine’s Day together. Maybe you need to impress a client. We define luxury as a sumptuous atmosphere, service that encourages relaxation and lingering, and, of course, indulgent food. You’ll notice that some of the most popular tasting-menu spots and some of the most expensive places in town aren’t included here. That’s because the restaurants below are the whole package: glamorous and delicious with service that makes you feel truly special. 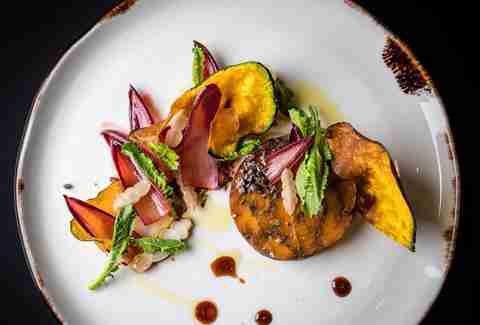 In Philly, luxury doesn’t necessarily mean unaffordable, but these meals are worth the splurge. We’ve broken them out by the average cost for dinner for two with tax and tip, assuming you order starters, entrees, dessert, and drinks. Start budgeting accordingly. With a choose-your-own-adventure menu of small plates, toasts, vegetables, raw items, and large plates, dinner costs can range, but expect to pay $150-$250 for two. When in doubt, trust the experts. Jonathan Adams, co-owner of Rival Bros Coffee, loves Fork for “the level of service, attention to detail, and tableside flourishes.” For instance, “oysters being presented in a crystal bowl covered with a glass cloche makes for a dynamic and unforgettable dining experience,” he said. Expect to pay about $200 for two, depending on how much you order and drink. It’s always been about the wine at Panorama ­­­­-- in part, thanks to setting the Guinness World Record as the World’s Largest Wine Bar ­­­­-- but with a renovation and new chef, this 26-year-old standby makes for a memorable meal. Start with one of the 150 wines by the glass available or choose one of 29 wine flights. Executive Chef Matthew Gentile, an alum of LaCroix, Ela, and Parc, developed every dish on the menu to pair well with wine. 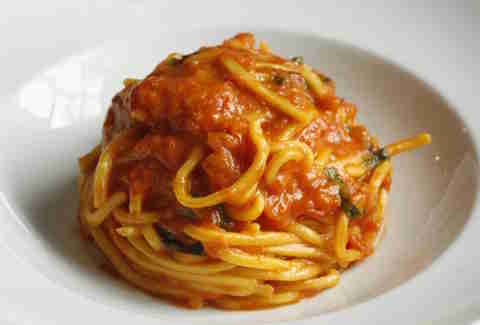 Don’t miss the house-made pastas in full or half portions. With a wine flight each, a duo can get out the door for less than $200. Reviews of the newly opened New York City export (with other locations in Miami, Las Vegas, and The Hamptons) in Rittenhouse haven’t been flattering. Our experience, though, has been different. 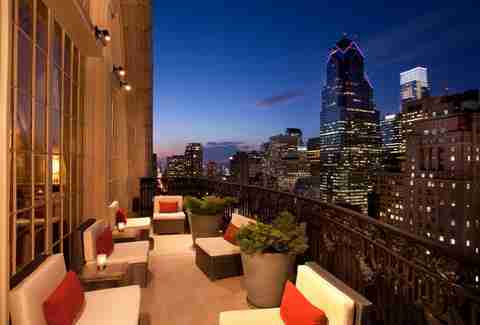 The location alone, overlooking Rittenhouse Square, sets a special-occasion tone. So does the sleek interior, glowy lighting, and well-trained service. This isn’t a white tablecloth-type of fancy place with soft music playing ­­­­-- expect to speak a little louder or get closer to your dining partner, which may be just the excuse you needed. Many dishes are served under a white cloche, adding a touch of glamour to your meal. Underneath those domes are creamy polenta with truffled mushrooms, duck and foie gras ravioli, halibut en croute, veal tenderloin ­­­­-- and of course, the restaurant’s iconic tomato & basil spaghetti. A couple can take a tour of the menu for under $200, with wine. One of the oldest Italian restaurants in the US in two converted townhouses in the Italian Market (complete with some mob history). White table cloths, old-school servers, and pasta with gravy (red sauce). Location, location, location. Impress a date on the 19th floor of the Bellevue with views all around, a 19-foot Italian chandelier, and strands of pearls draped from the high ceilings down to the circular raw bar. Reviews of Aqimero have been rough, but there’s no denying that dining in the Ritz-Carlton lobby with its soaring ceilings, marble pillars, plush seating, and flattering lighting is a luxurious way to spend an evening. Plus there’s a new Chef de Cuisine (Paulo Mendoza) in the house as of a couple months ago. At $65 a person for four courses, plus a few extra bites from the kitchen, Ambra is one of Philly’s most affordable upscale spots. Southwark owners Chris D'Ambro and Marina De Oliveira serve a refined Italian menu in the intimate, 16-seat special occasion spot. Amuses-bouche and canapés ­­­­-- and often, glasses of bubbly ­­­­-- start appearing on the table as soon as you’re seated. Then, you’ll choose between two options for each course, that include antipasti (such as hand-pulled burrata or crudo), creative pastas (like smoked tortellini with concord grapes and shaved, cured egg yolk), fish or meat, and dessert. 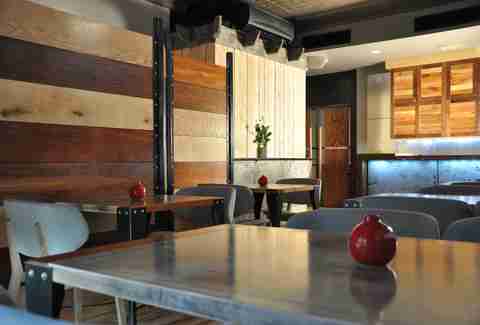 The menu is constantly changing with market availability and seasonality. A thoughtful wine pairing can be included for just $35, making dinner for two come in at less than $250. Get gussied up, order a martini, and cheers to the good old days. Assuming you order steak and drinks, expect the bill to be in the $200-$300 range. Try the New York Strip tasting with 6oz portions of three artisanal steaks and have a drink at the new rooftop bar, Assembly, after dinner. 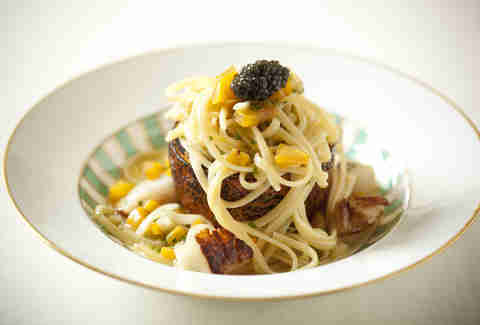 Also on the menu: caviar, oysters, foie gras, and A5 Wagyu. 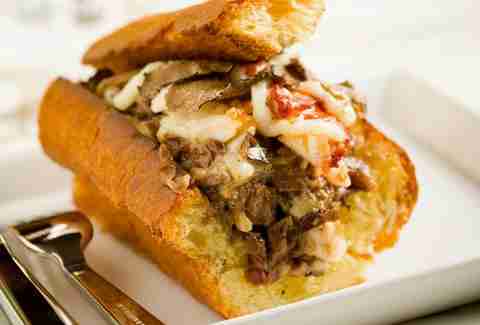 Get the fanciest cheesesteak you can find in Philly. For $120, split the Barclay Prime Cheesesteak, made with wagyu ribeye, foie gras, and truffled cheese whiz on a fresh baked sesame roll, served with a half bottle of Champagne. You'll be amongst bookshelves circling the dining room, black and white checkered floors, zebra print rugs, and lime green accents. One of Philadelphia’s most beautiful restaurants, the Prime Rib evokes a glam 1940s supper club with leopard print carpets, black leather chairs, a sunken dining room, rare beef, and cocktails in proper glassware. After a quick table-side chat with a friendly server, the team at Chef Marc Vetri’s intimate, 32-seat ristorante crafts a tasting menu based on each diner’s preferences and what’s in season. Then, Italian specialities ­­­­-- usually including the signature dishes of spinach gnocchi, sweet onion crepe, and goat with polenta ­­­­-- begin flowing from the kitchen. Opt for the thoughtful Italian wine pairing from the 2,500 bottle cellar. “The entire experience, from the service to the food combined with the romantic atmosphere of the dining room, makes this my go-to pick,” said Chad Williams, chef/owner of Friday Saturday Sunday. Fair warning: At $155 per person, plus a beverage pairing at nearly the same price, dinner for two can easily run over $600. 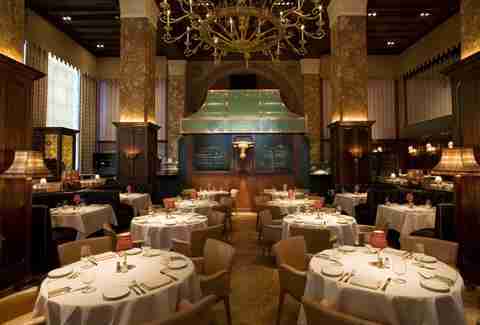 Lacroix’s elevated, airy dining room overlooking Rittenhouse Square sets the mood for a luxurious, white tablecloth meal. 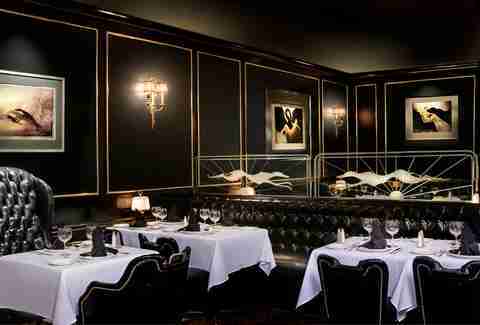 ­When dinner starts with caviar service, you know you're settling in for an elegant experience. Dinner is a five-course tasting menu, starting with raw items, moving into delicate vegetables, and seafood, hearty meat dishes, and seasonal desserts. Brunch here is like nothing else in Philly: buffets as far as the eye can see with creative appetizers, salads, savory dishes, mini desserts, a chocolate fountain, a liquid nitrogen ice cream station, and ­­­­-- of course ­­­­-- a raw bar with all the caviar you desire. 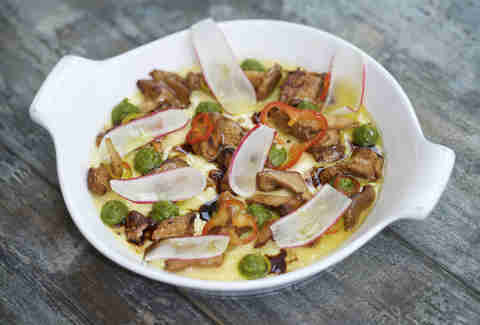 Dinner goes for $105 per person, plus an optional $85 wine pairing, resulting in a meal for two totaling more than $400. Brunch runs about $200 for two, with mimosas or Bloodys. 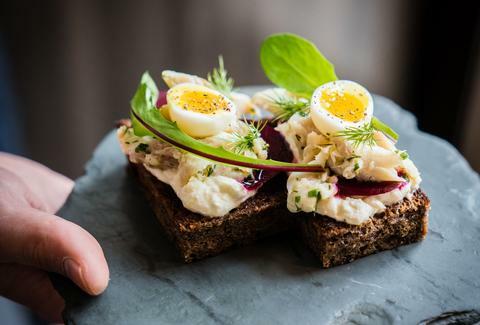 Volvér is Chef Jose Garces at his most avant-garde. Situated inside the Kimmel Center for the Performing Arts, this 10-course dinner is the show. Volvér’s tasting menu takes inspiration from Garces’ international travels, seasonal ingredients, and modern cooking techniques. For example, the Pennsylvania breakfast staple scrapple takes an elegant turn when paired with braised duck, foie gras, plantain jus, brazil nut, and sherry. 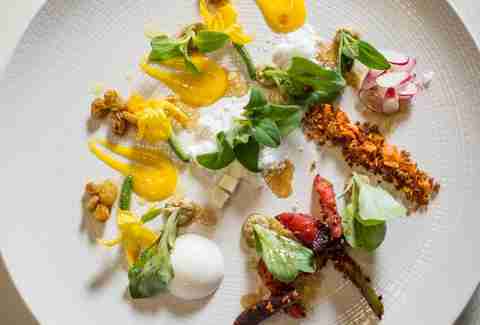 And get your camera ready: Every plate looks like a piece of modern art. Expect to pay over $300 for the 10-course tasting for two, or over $500 with the wine pairing. Sarah Maiellano is a freelance writer in Philadelphia. Her bank account wishes she didn’t know so much about these fancy restaurants. Follow her on Instagram @sarahmaiellano.